/\ New $74 million 15 story Park Place condo tower proposed for Second Street. There's also a new $67 million 10 story North Pavilion Tower about to break ground next month! The news broke on the condo tower last year and the Pavilion Tower this spring. Its cool to finally have a rendering of Park Place now that its at its new location! Units are going for $280,000-$2million. This certainly is great new for Winston-Salem! Not just one but two towers! Th North Pavilion is part of Forsyth Medical Center in the Hanes Mall area, which is a considerable distance from downtown. I've seen the Park Place news, which is great, on other fora, but still no mention in the media unless, I just missed it? The renderings were for WSNA viewers only to plan and approve the project. A WSNA member at Brookstown Neighbors got excited and posted them on a public forum before they were officially released. You will hear more about it next spring. This is the final design. It does look like that Columbia building! Down to the upper floor window and the top of the building! The corners are also the same! Thats just like there is a building in Columbia that looks like the proposed Triad Tower in Greensboro. I guess Columbia is becoming the city to model new buildings after. I looked up the project and the $74 million is for Park Place South. Park Place Tower is only $38 million. Park Place South will have an 8 story Hilton Garden Inn hotel overlooking the proposed Civic Plaza Park, a new 27101 post office and the Galleries at Park Place lining the strollway. I don't know the status of the hotel or galleries. I they are just proposed right now as part of the city park and will break ground with the park. Hilton has agreed to be part of it when it breaks ground and is mentioned in the 17 page document presented to the city hall. Where do you "lookup" this stuff. This is the first I've heard of a Hilton, shops, etc., not to mention the 15 story condo? I'm a member of MWSA. These plans need our approval before the city and County considers them. Of couse they are also public documents anyone can look at in City Hall South. The problem is do you know they exist to look them up. Nothing is released for Press from City Hall unless it is a sure thing. This is going on off the radar screen right now. I don't know if the hotel and galleries will materialize? Don hasn't moved past the vision stage with that but he did get a hotel chain for the proposed hotel. The renderings only show the condo tower and we do know the condo tower is slowly moving foward. You will see it in the news when the first units go on the market and they formally seek funding. I'm not familiar with the acronym MWSA, but anyway thanks for the explanation. I'm a native of W-S hence my interest, although I do not live there now - sense of place you know. By the way, do you ever post on skyscraperpage.com? I've not noticed any. No I don't post on SSP. I would like to see more of the SSP crowd posting on UP or SSC. We need to share some of those nice photos on other forums. I post about once a month on all the forums. I only wish Matthew would post on Winston-Salem over here and at some of the other forums. Park Place South required the destruction of the post office and two parking decks. This current scaled down plan only calls for the destruction of one parking deck and the post office and the other deck will be kept. They will build this single condo tower and when the park breaks ground they will build the galleries around the strollway. Don is moving his hotel to Liberty Street when they close Third and open up a long space for the hotel. He is at the table with the city and Piedmont Federal bank trying to buy that property for his 8 story hotel. It does look like towers will surround the park when its build just like the city and Sasaki Associates predicted. All of this will be super sweet when its finished. A 15 story condo tower, possible 55 story bank tower, 8 story hotel, galleries, concert shell, sculpture, and an interactive fountain. All very big plans that will take atleast five years to get built but when they are finished will make such a big difference for those of us who live, work, and play downtown. I don't have a car so this is great for me. They also want to make the old courthouse across from One West Fourth and Winston Tower a grocery store. Ground can't break fast enough. So the 8 story hotel will be built when they close 3rd Street for the park! Great news and the Galleries at Park Place are still in the plans. I do remember an artist group talking about the Galleries at Park Place being built with or without the rest of the project. If you've been to the meetings you know they want to use the strollway to expand the Arts District south towards the Financial District. They will do it with galleries along the strollway and the city's Pedestrian Walkway System. Did they actually build this proposal? no, the person who started this thread doesnt even exsist. How lame can u be...pretending to be 3 different members. Its actually kinda of funny having a 3 way conversation with yourself. I kinda figured it out when certain words were mispelled by the same screen names. 55 stories?? Who is supposed to be buidling that, BB&T? To me it seems like a tower that big in W-S would just dwarf everything else and look a little silly. What are the possibilities of 25 story twin towers? yea, 55 may look out of place...something around 40-45 stories would fit well. nothin is proposed over 14 stories in downtown Winston yet. i forgot to add...the 10 story building is u/c by hanes mall. no word on the other one. I don't think the other one materialized and was just a proposal. I wish the Hilton Garden Inn got built along with the 55 story BB&T building. I don't think a 55 story tower would look that much out of place considering that the Wachovia Center is 460' tall and that there is enough topography downtown that it might be built in a lower area like the site of BB&T's hq. 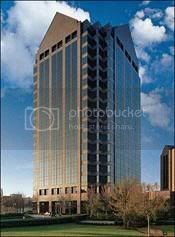 Look at the effect of the BofA building in Charlotte v. the previous tallest old First Union hq - it's 280 feet taller or the equivalent of a 20-25 story bldg on top of the First Union bldg. And so, it's not a stretch...the stretch would be to get BB&T to actually build a new headquarters (and then actually build it tall).